My classroom sits a stone’s throw away from the White House and the State Department, which makes me all too aware that when, from time to time, I refer in class to the ways in which “history casts a shadow on the present,” I’m not just indulging in a rhetorical gesture. Even so, it takes more than physical proximity to drive home that point, which is where the History and Policy Education Program comes into play. After learning from my colleague Dane Kennedy of its successful implementation in his class on Victorian Britain, I was inspired to follow suit and to integrate this heuristic device into my undergraduate seminar on American Jewish history. Reader, it worked. The seminar, which drew almost exclusively on primary sources, pivoted on a series of crises that roiled the American Jewish community from its inception in the mid-17th century through the 21st. While some of these alarming moments were generated from within, a substantial number were generated from without, challenging American Jewry’s sense of belonging. At the top of the list: Peter Stuyvesant’s churlish welcome of a group of ill-fated Jews from Recife, Brazil: Harvard and Columbia’s quotas of the interwar years, and the hotly contested US Supreme Court nomination of Louis Brandeis. 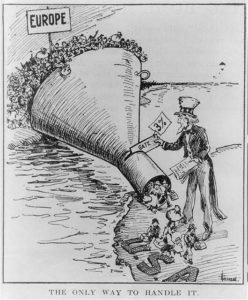 An illustration for a 1921 article on an “alien anti-dumping bill,” shows a funnel bridging the Atlantic with Uncle Sam permitting limited amounts of immigrants to enter the US. Image courtesy of Library of Congress. Each of these themes, and the historical context that gave rise to them, figured prominently on the syllabus, but to gild the lily and to underscore what was at stake, they also became the stuff of the students’ broader engagement, especially when it came to their more contemporary iterations. The class of ten undergraduates, most of whom were seniors (but not necessarily history majors), constituted themselves into three different teams: the first zeroed in on the history of US immigrant policy; the second on contemporary university admission policies; and the third trained its sights on contentious US Supreme Court nominations of the 20th and 21st centuries. Over the course of the semester, the students had several different opportunities to present their work-in-process and elicit feedback from one another; I made sure to devote a substantial chunk of class time toward that end and not to rush through this end of things. What’s more, I made a point of sending materials their way when I would happen upon something relevant in The Atlantic, The New Yorker and Tablet: grist for the mill. Shortly before the end of term, the students had a “dress rehearsal,” which was followed a week or so later by their formal presentations, each of which ran for about 30 minutes plus a brief Q & A. In the wake of their presentations, they submitted a 2-3 page reflection piece on the collaborative process and what they took away from the experience as a whole. Each team acquitted itself quite well, even imaginatively and took to its chosen theme and mode of presentation with a modicum of hand-holding and cheerleading. The immigration team, drawing heavily on political cartoons and broadsides, came up with a visual narrative of US immigration policy; the quota team produced a documentary that mixed historical material with interviews of GW admissions personnel, law school faculty and “people on the street,” while the confirmation team translated its research into a play, replete with both a script and a performance of a fictitious Supreme Court hearing where all hell broke loose amidst intensive questioning. As luck would have it, every single one of the issues the students explored was in the news and hard-to-miss throughout the term, deepening their imprint on the body politic – and, especially, on the students themselves. Jenna Weissman Joselit, the Charles E. Smith Professor of Judaic Studies & Professor of History at George Washington University, is the author, most recently of Set in Stone: America’s Embrace of the Ten Commandments.